Hackersoft have always been fascinated by game characters and sprites, and so from that came a need to produce a demo that featured multiple game characters. It started off as a skive off work, and then slowly developed into something special. 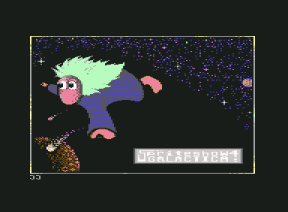 Only four sprite shows were ever produced and there were plans and drawings to produce the fifth instalment, which never really got off the ground. ASSISTED BY: Unknown person who produced the great tune. PRODUCTION NOTES: This program came about after reading a sprite programming article in one of the later issues of Commodore Format magazine. It was the first time that Hackersoft would use animated sprites - even if they were monochrome. This program took about 2 days to produce. PRODUCTION NOTES: This demos was programmed in one day by Hackersoft founder, Vinny Mainolfi. It is said that he was taking a sickie from work and decided to spend his time on something more productive. Vinny feels that this demo is the best out of all the four Sprite Shows. ASSISTED BY: Great intro artwork and some additional ideas from Simon Reece. 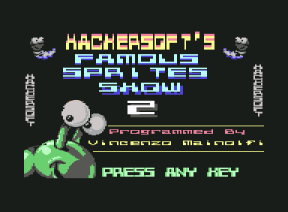 PRODUCTION NOTES: Yet another sprite show from Hackersoft that didn't take too long to produce. One reason for this was the lack of BASIC memory space, which eventually limited the amount of sprites that could appear within the show. If only Vinny Mainolfi of Hackersoft had bothered to learn some machine code. PRODUCTION NOTES: The final Sprite show is taken into space and has an element of Star Trek to it. The only reason why there is a fourth slide show is because of the many requested from the Editor of Commodore Scene magazine for Hackersoft to produce another version and write a diary of the programming - which was printed in Commodore Scene magazine. The slide show was officially released via the magazine on a FREE disk.